XTM International is pleased to announce the release of XTM Cloud v10 today. This version of the award winning translation management system is also the most feature packed release ever and takes XTM to even higher levels of automation, collaboration and functionality. “This major new release is largely based on feedback from our customers about the features they most needed. We are delighted that we have been able to combine them with a new interface to XTM, greatly enhancing the user experience.” Says Bob Willans CEO of XTM International. Version 10 has a brand new look and feel, with state-of-the-art, appealing graphics providing better contrast and clarity, improved screen layouts, and better ergonomics. The new design comes with Smart Filters, a very effective way to increase project management efficiency, by adding the possibility to display a list of projects with just one click. 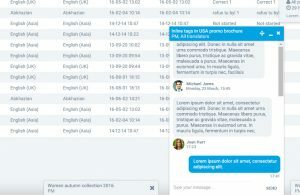 The new XTM Messenger introduced in XTM Cloud v10 simplifies and accelerates the exchange of instant information between project members, which is essential for agile translation. Thanks to XTM Messenger, teams can experience a truly enhanced level of collaboration, without leaving XTM Cloud. Many XTM users localize highly confidential text, so with security in mind, XTM International has developed an innovative feature called anonymization. When this is activated, XTM Cloud v10 identifies sensitive customer information such as names, addresses or telephone numbers, and masks them by replacing them with a placeholder. In this way, when the text goes for translation, whether manual or machine translation, there is no risk that confidential information will be leaked. Assigning the best performing resources to projects and delivering the results with confidence has never been so simple. In XTM v10, you can store LQA results against linguists involved in translation tasks giving you the ability to track their quality performance over time. 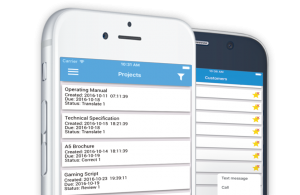 The latest release of XTM Cloud v10 is introducing a new app for project managers running on iOS and Android tablets and smart phones. They provide instant access to projects on the move making use of the smart filters built into the app. Monitoring projects and assigning resources to tasks in the workflow at any time day or night is now a reality. 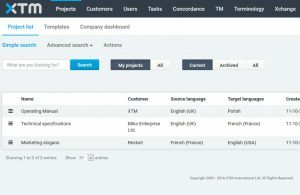 The combination of these and more features, with a host of other improvements, establishes XTM Cloud v10, at a new level of translation management. XTM Cloud v10 is now available as free update to all users. or attend any of the free committed webinars. XTM International develops XTM, an award-winning online TMS, available via the cloud or on your own servers. The centrally shared TM, terminology, workflow and translator workbench are all accessed via a browser. XTM is cost effective, easy to use, includes filters for all common file types and is built for collaboration. Our global customers range include some of the world’s largest LSPs and enterprises.